« Discussing Network Operator Involvement in the IETF, at IETF 91! 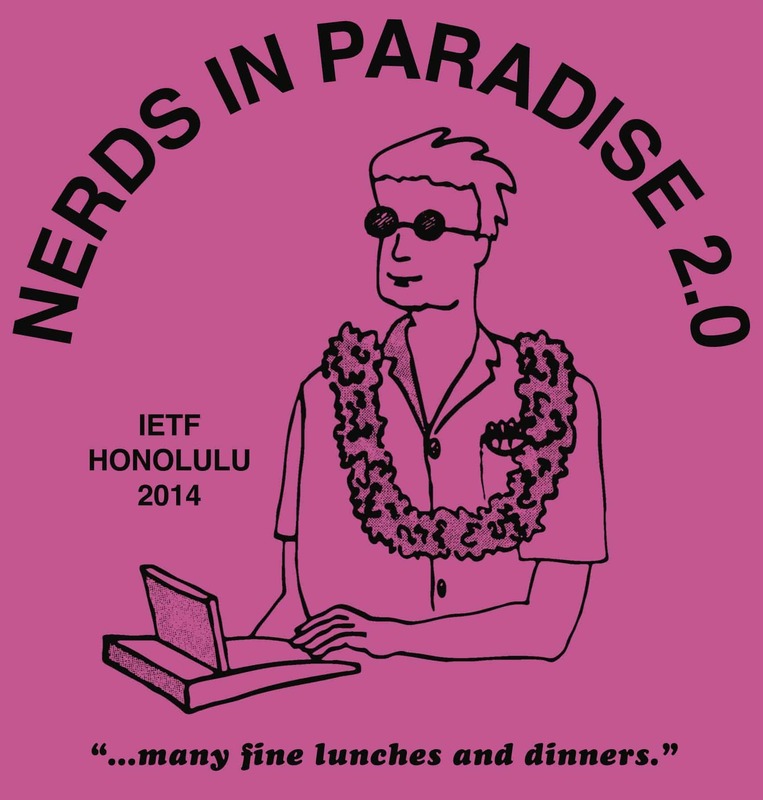 Two weeks ago I let you all know that I would be presenting our Operators and the IETF Internet-Draft at IETF 91. What a busy two weeks it’s been! Between all of the amazing presentations and conversations in Honolulu last week, and then hosting our first ever ION Tokyo this Monday, we’re all just now catching up, gathering our thoughts, and looking at next steps. The presentation in the IEPG meeting was condensed to only 5 minutes due to time constraints. Even so, it generated several comments in the room, and a fair bit of interest and hallway discussion afterwards. A plan to start hosting an “IETF Help Desk” at regional NOG meetings. The mailing list was set up by IEPG and OpsAWG co-chair Warren Kumari on his personal server, to provide a neutral format for these discussions. We expect the list to be used by both IETFers and Operators, as well as those who are both or somewhere in between, to discuss the results of the survey, to generate and discuss possible solutions, and to start coordinating the execution of those solutions. The first thing the list will be used for is finding volunteers for the IETF help desk. The idea of the IETF help desk is to provide a common / well-known place for operators to bring their questions about the IETF and have them answered by those experienced with the IETF. We do not expect anyone to travel to NOG or NOF meetings specifically to staff this desk. Instead, we’d like to find those folks who have significant IETF clue and are already planning on attending a given NOG/NOF meeting. We can use the ‘synergy’ list to self-identify and volunteer for this work. In this way we can prearrange to have the IETF help desk open at specified and pre-published times. We expect questions asked at the desk to be along the lines of “what is the IETF working on in X space?” “How do I get involved in the IETF?” “How do I submit an RFC?” etc. Outside of the public meetings, I also had the chance to chat with many people throughout the week in the hallways, at meals, and anywhere else we happened to bump into each other. Everyone I spoke to personally re-confirmed that work in this area is indeed needed and that the current course of action is helpful. If you disagree, we’d love to hear from you! In addition to all of these planned presentations and interactions, the Operators and the IETF draft got some unexpected attention. First, during the IETF 91 Operations and Administration plenary, Brian Carpenter took the opportunity during the IESG open microphone session to ask the IESG to read the draft. In particular he pointed to the statistic that 44% of the operators who responded to the survey told us that they did not feel their input was welcome at the IETF. After some discussion around this point I stood at the mic to elaborate that there are many more statistics and ideas in the draft, imploring those interested in the topic to give it a full read through. I also mentioned something that has come out of our further reading of the survey results: These potential challenges and possible solutions transcend the operator community. While we set out specifically to help solve the perceived problem of not enough operator input, we have found a lot of ideas that could likely make it easier for everyone to participate in the IETF – particularly newcomers of all types. If open APIs become the de-facto definition of interoperability requirements, the role of the standardization bodies, and the opportunity for operators to influence specifications, diminishes. As a result the functional interoperability (and interchangeability) of vendors and devices will decrease, potentially leading to a more proprietary and less open and global nature of the Internet. You can find the quote on slide 4 and hear Dave talk about it at 00:20:50 in the video, although I highly encourage you to look through the whole deck and view the entire talk. In particular, I found slide 16 “IETF Existing Structure Revisited” and his laws for SDOs and OSS very insightful. From our side, here at the Internet Society, we’re hitting the road! We’ll be presenting this information everywhere we can get the chance. We want to get in front of as many operators and operator groups as we can. Our goal is to ensure that we got the survey results right and to start working on defining and implementing the best solutions. A big part of this is tearing down misconceptions and ensuring that operators (and other newcomers) have the information they need to get involved when, where, and how they need to. Please join the mailing list and get involved in the discussion! If you have ideas, insight, or feedback – let us know! If you are willing to help implement solutions, including staffing an IETF help desk at your favorite NOG/NOF – let us know! As always, if you have any comments or questions, please do contact us. This post originally appeared on the Deploy360 blog. Operators and the IETF: Update from IETF 91 is a post from don't panic – One Network Technologist's View of Life, the Internet, and Everything.